Perhaps the title for my contribution to this week’s Thursday’s Children isn’t very original, since writing about where we find the inspiration for our writing is what we do every week for Thursday’s Children, right? But I’m not talking simply about where we find our inspiration but how to find it. In terms of where we can find inspiration for our writing – well it’s all around us. In nature, in music, in film and in books, from our families – the list is endless. That’s all very well. But what about how we find inspiration? How do we tap in to all these infinite wells of inspiration and use them to shape and improve our writing? I’ve found it very helpful to communicate with other writers, whether face to face or digitally when I need to know how to find inspiration. Other writers can give us perspective on our work, help us to see how we can turn that sentence around, so that we’re showing rather than telling. (Showing rather than telling is something I find really hard to do!) Or maybe another writer might tell us how we could improve the dialogue in that pesky scene we just can’t seem to get right. Maybe you think I’m going off on a tangent here, but actually style in our writing is vital if we want to learn how to tap in to all this inspiration that’s around us. OK so you may be really inspired by the beauty of spring, but if you can’t write about it without your work looking and sounding clunky you won’t be going anywhere with it. Your work will be the opposite of inspired – it’ll be heavy and uninspiring. Working on style in our writing is hugely important. If we perfect it enough, it can enable us to use what inspires us to make our work inspiring to our readers. Not enough adjectives and our work is lifeless, but use too many and it can be overkill. Not enough dialogue and our work can become dry and barren. Too much dialogue and our writing can end up feeling colourless because we haven’t set the scene. There has to be a happy medium. 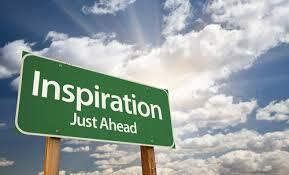 So how else do we find the way to use the inspiration we have around us? It’s not easy but I believe that with writing the old saying is true: practice makes perfect. Yes I know it’s a cliche. But our writing will only improve if we keep on persevering with it. Our brains need exercising to keep them sharp and I think it’s true of our writing too. We need to do something towards our writing every day. Whether it’s adding a few more paragraphs or pages to our work in progress or updating our blogs as I’m doing now, to keep our writing fresh and interesting instead of stale and boring we need to be constantly practicing. I’m sure there are many other ways of how to find inspiration for our writing. But the ones I’ve mentioned are certainly important and are some of the things I’m trying to think about in my own work. If you can think of others, please let me know. I’d love to hear your thoughts. If you would like to join in the blog hop fun that is Thursday’s Children, simply write a post on your blog about what is currently inspiring your writing. Then add your name to this linky. Big thanks go to Rhiann Wynn-Nolet and Kristina Perez for hosting. ‹ PreviousNot another WIPpet Wednesday! Reading Thursdays Children’s post is a huge inspiration for me. Maybe not everyone inspires me every week, but there always is some tidbit or sometimes a huge boost that hits a nerve and get’s me going. Thanks Pat. I too find Thursday’s Children posts very helpful. It’s so good to be able to connect with other writers so quickly in this modern digital age. Oh, I’m so glad you both find TC has nuggets of gold – and I totally agree! Reading great writing in any format always inspires me (blogs, books, magazines). Yes I certainly do. And I’m with you on the reading side of it – so much inspiration to be found from all sorts of writing. Great post, and so true. Sometimes inspiration smacks you right up side the head, but more often than not it’s the steady slog of pushing yourself, bouncing opinions off others, and taking classes that gets the job done. Thank you. And I totally agree with you about the hard slog paying dividends in the long run. So true! All you WIPpet buds have really encouraged me in terms of all the stylistic tidbits I glean from your examples! I second that! The WIPpeteers’ comments have been invaluable. Very inspiring, Elaine, as others have said. I’m getting together with some writer friends over the weekend, so I hope to be inspired as I return to a novel I started years ago. Getting out in nature is very inspiring to me. I love hearing the birds chirping away. Reading is another source of inspiration. Books by my favorite authors usually inspire me. Practice makes perfect and that in itself is inspiring. The same as anything it takes hard work and dedication to improve and grow as a writer but it’s all worth it in the end. I agree that hard work definitely pays off. But it can be tough sometimes to keep the momentum going I find. I had a hard time with showing vs. telling for a long time, too. I’m not sure when or how it finally clicked. Maybe I beat my head against one too many revisions. Great post ! Thanks Dannie. I hope I get to the point you’re at soon. It’s tough for me trying to learn how to do it at the moment. I’m working on my “style” and my CPs and Betas inspire me tremendously. As does reading a slew of books, lol! Writing, to me, will always be a work in progress. Great post!! I totally agree. Sometimes we forget that writing is a craft and we all have to start as apprentices! Exactly. It’s a question of honing it I think and I’m very much still an apprentice!